English is and has always been recognized as a difficult language to learn. Native speakers (and teachers of English courses) acknowledge as much. Imagine learning English as a secondary, or even tertiary, language! If you aim to become an English as a Second Language teacher in the United States, you understand well just how much of a challenge your future students will face. In order to help them to the best of your ability, you will have to have the proper training and credentials. The state of Oklahoma requires all of its incoming teachers to earn a passing score on the OSAT exam related to their field before they can enter the classroom. In your case, this will be the OSAT English as a Second Language exam. While this exam won’t be easy, you can definitely score well on it with the right preparation. Our team at Mometrix Test Preparation is devoted to helping you as thoroughly as possible throughout your studies, and to do so, we strive to create and offer excellent resources for you to use as you see fit. 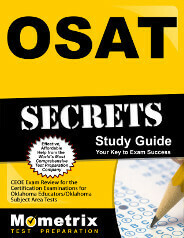 To this end, we would like to present you with our OSAT English as a Second Language (177) practice test. Thanks to careful research, this test is designed to serve as a comprehensive and accurate measuring stick of your preparedness to take the real exam. As such, its contents closely mirror what you can expect to find come exam day. The former category has only one question, its subject being Analysis and Application. We hope you will be able to make our OSAT English as a Second Language practice test an effective part of your study plan. For best results, we encourage you to pair this 100 percent free tool with our companion English as a Second Language study guide.